Many Californians first encounter good sake at high-end, non-Japanese restaurants. The French Laundry has used sake on its pairing menu for years. Sake in these restaurants usually comes early in the meal with a raw fish course. But sake works with the entire menu, and especially well with dishes that are earthy, mushroomy or creamy. I went to an event for sommeliers in San Francisco intended to prove that. 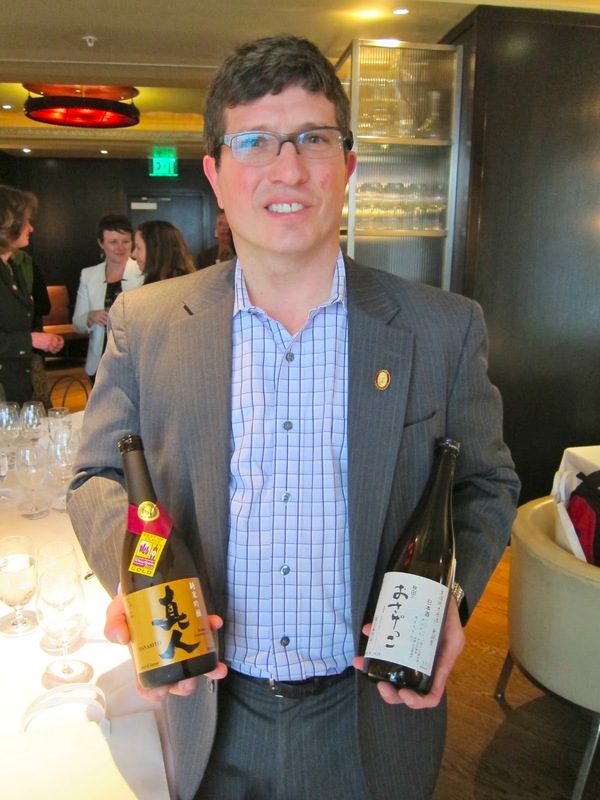 Fifth Floor chef David Barzigan made a five-course menu, and two master sommeliers, David Glancy and Emily Wines, chose one sake for each course in a sake-pairing challenge. For sommeliers, this is fun. For the average drinker, I'm not so sure. On an airplane last week I watched "Bernie," a true story about a Texas man who murdered his elderly female companion. The prosecutor, trying to show the jury that Bernie was a man of first-class tastes and desires, says, "I'll bet you know the right wine to go with fish." Bernie says, "I don't know, white wine, I guess." The jury sentences him to 50 years. What struck me about the event wasn't which sommelier could pick a better sake to go with truffle flan with yellow foot mushrooms, or confit lamb belly with spiced eggplant puree, or blue cheese on crispy bread. Instead, I liked seeing how well a sake pairing menu goes with the entire meal, start to finish. "When I teach consumers about wine, it's very much demystifying and taking away rules," said Glancy, who founded the San Francisco Wine School. "How often does a wine ruin a dish? It's pretty damn rare." This is how I eat at modern-style Tokyo restaurants: I order some dishes and a glass of sake. When that runs dry I order a different glass. When I run out of food I order more. Drink and repeat. You can overthink sake pairing just as food writers sometimes overthink wine pairing. But you do get different effects. With creamy lobster salad on a sweet brioche, Glancy chose a clean, dry Hakkaisan Tokubetsu Junmai; Wines chose a creamy, rich Kikusui Hiyaoroshi Junmai Ginjo. The first was contrast; the second was complement, and they both worked fine. 1) Pick a good sake. This may seem like a no-brainer, but it's really important. Same thing with wine, right: wouldn't you rather drink your favorite Pinot Noir with an unusual match then a Chardonnay you don't like, even if the sommelier recommends it? 2) Junmai ginjos and junmai daiginjos are the most white wine-like and work well with fish dishes. 4) Genshu ("cask strength," or undiluted) sake is higher in alcohol and stands up well to meat. 5) Sake is a nice changeup in a progression of wines. It's a little higher in alcohol than most white wines (14-20 percent, with most around 15.5) so it can go after the white wines but before the reds. Or it can go before the white wines. Or it can go in between reds to refresh the palate. But it can work anywhere on the menu.